Over the years, we've treated our kitty crew for a variety of ailments, a number of which required pills. Recently, Zoro was on antibiotics – two pills a week for 10 days – after his cheek was injured and got an abscess. We became very efficient at giving him a pill with minimal stress to us or the cat. Given all the horror stories and bad jokes about pilling cats, I decided to share our technique. It works best with two people, but if you bundle kitty tight, you could do it with one person. Grab kitty's head from behind in what she called “the baseball hold”. Pry mouth open and stuff in pill. Hold mouth closed and gently blow at kitty's nose to encourage swallowing. Open mouth and check to see if pill went down. If not, repeat the process. Given that the vet has undoubtedly pilled hundreds, if not thousands, of cats, she did this like a boss. When we tried it, the cats were less cooperative – or they caught on and wanted nothing to do with it after the first pill. One person holds cat on lap with cat on back and gently pries open mouth. Second person drops in pill. First person (holding cat) clamps cat mouth shut and gently blows in nose to encourage swallowing. Second person used a syringe to dribble a little water into cat's mouth, also to encourage swallowing. Check to see if cat has swallowed pill. If not, try a little more water and a little more gentle blowing. If you only have to give a cat one pill, the veterinarian technique will likely get the job done. With a series of pills, I highly recommend the kitty burrito method. We used to end up wrestling with the kitties and having a lot more difficulty getting pills in. 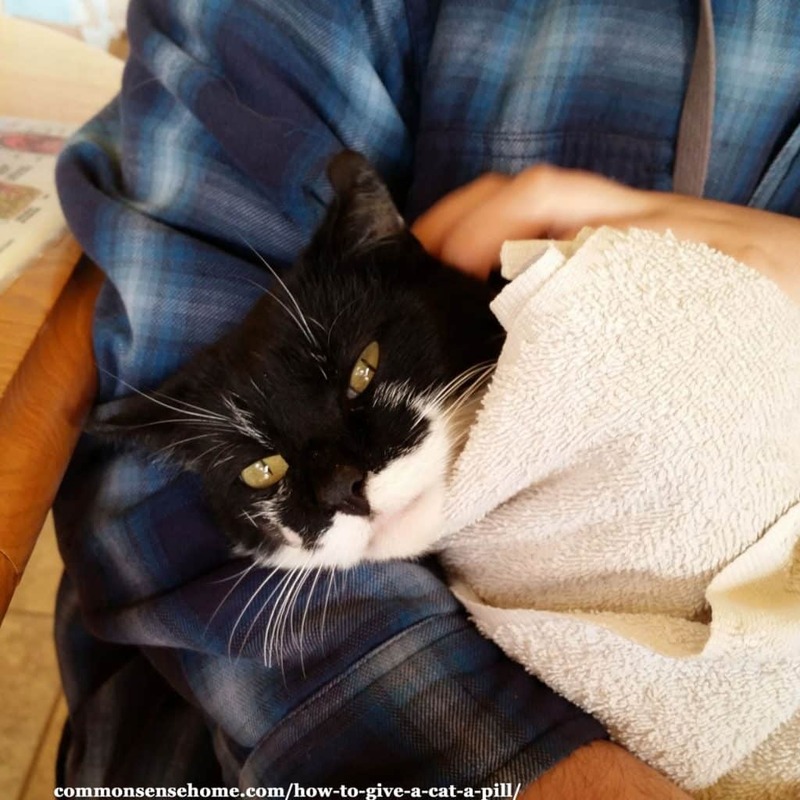 With swaddling the cat in the towel and holding it on its back, the pill gets swallowed quickly almost every single time. Handle your cats regularly, including around the face and mouth. Some like it, some don't, but if you can make them comfortable with it, pilling will be easier. 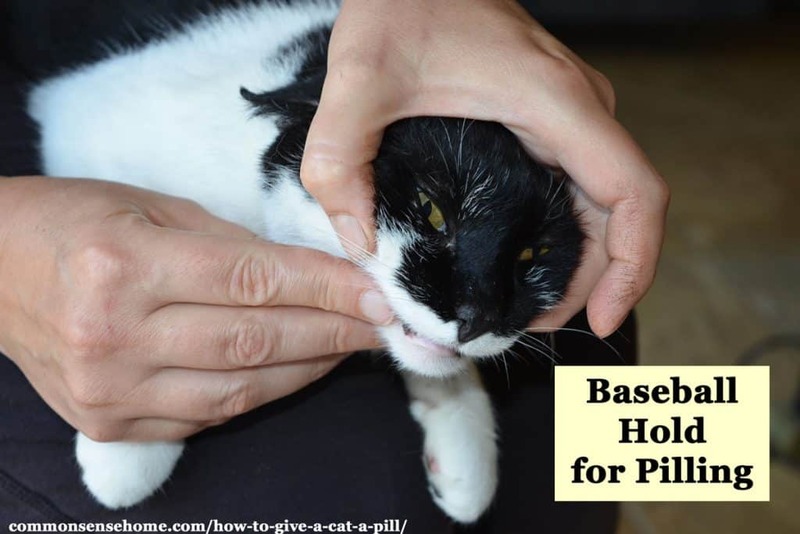 With both methods, it's important to get the pill into the cat's mouth as far as you can, so it's not easy for them to spit it out. Cats are notorious for cheeking a pill and spitting it out as soon as you let them go. Always double check that the pill is swallowed. (See above.) If your cat licks his lips, odds are he's swallowed the pill, but it's best to check. Praise and pet your kitty while giving the pill and after the pill is taken. 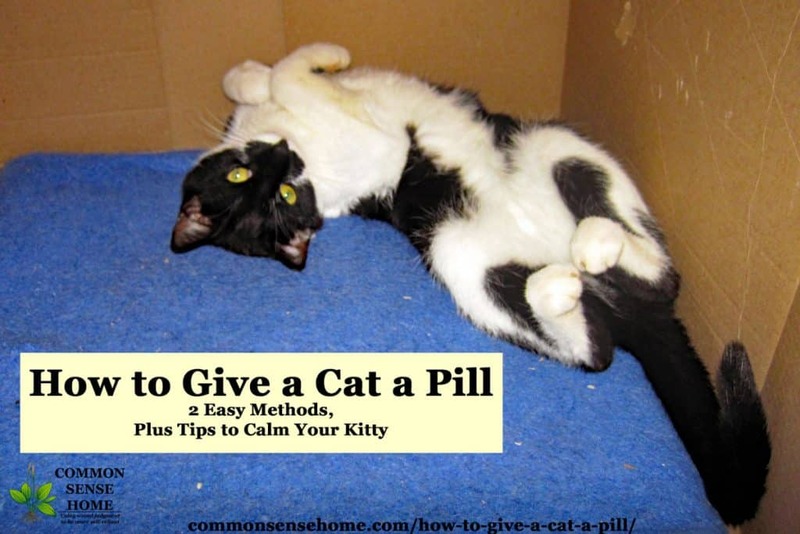 This is stressful to give a cat a pill, so it's up to you to be loving and patient. We have a cat that even the vet tech can’t give a pill or liquid medicine. Your post gave me a chuckle. Our cat even spits the liquid back out. He’s a big baby that loves attention, but we always have to insist on shots if he ever needs an antibiotic at the vet. I had another reader email me who is in the same boat. She says it takes three people to hold down her cat when it goes to the vet for an exam. 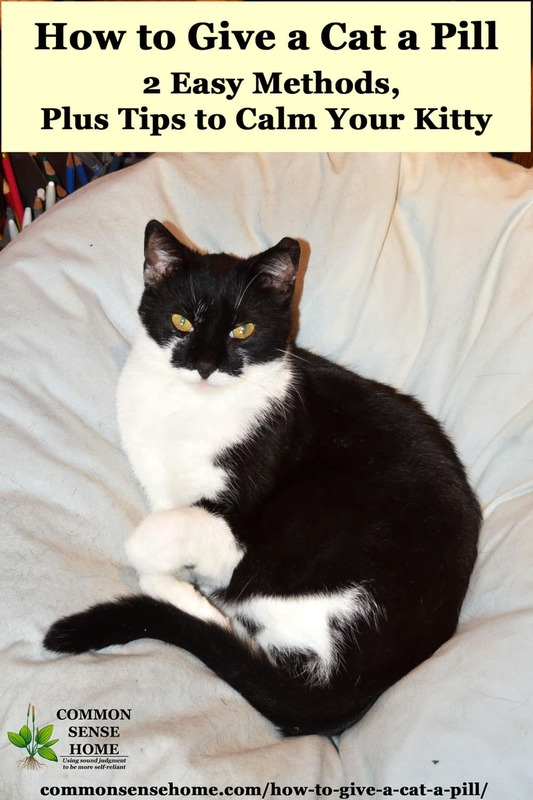 I know Zoro is more cooperative than many cats, but we have used these methods on the entire crew, even Miss Kitty, who was a barn cat for the first many years of her life and not handled before she decided she wanted to live here instead. Thankfully – vet visits aren’t bad. He just won’t take any medication orally. Our other cats aren’t so bad, but Mr. Alpha kitty is awful. Otherwise, he’s a sweetie. Your suggestions will work on most of our other fur babies. Thanks! You’re welcome, and I’m glad at least most of the vet visit goes smoothly. Talking about giving pills to cats reminded me of the first time we pilled Ronnie, a very friendly stray who showed up at our door and moved in for a time. (I think he was dumped in the country by someone who didn’t train him as a kitten and then lost patience with his high energy levels as an adult, because he was into everything.) The first time I tried to pill him, it was textbook perfect – baseball hold, pill went in, he swallowed, we were done. The next time, he realized what was going on and wanted nothing to do with it. We had to use full kitty burrito, very snug, with an extra person holding, and another to keep the pill in. i have found that if you put the pill in vegetable oil…..and hold the cat in your lap like the first part of the article, that the cat tastes the oil not the pill and the pill slides down and away…..into the stomach….and all they seem to taste is the oil…..seems to be easier for me…..I have wrapped them up like the second part of the article, but they get wise and know something is about to happen that they do not like and they start wiggling and fighting and clamping mouth shut…..hope this helps someone…. Doesn’t the pill start to break down once coated with oil? When ours get moist at all the pill starts disintegrating. We tried coating with coconut oil, as Zoro loves a little taste of coconut oil now and then. but the pill started to get soft and he spit it out even faster. We end up giving tapeworm medication that is a rather chalky small pill.